Last week, I went to this restaurant and ordered nachos. I was gravely disappointed when a plate of chips and poured cheese was placed on top. I think there are people who like nachos different ways. I personally favor nachos to be baked and for the cheese to be melted onto the chips. I think I just like the texture better. I love adding beans to my nachos but I rarely have time to make refried beans from scratch. And the one thing I always have on hand are a few cans of chickpeas. Always! I decided to grab a can out of the cupboard and add a bunch of spices to it to jazz it up! I layered this with chips and cheese and it was revelatory. So good! And so quick. I like to make this for a little afternoon snack when friends come over—it’s simple. In a medium skillet, add the olive oil. When warm, add the shallot and cook until softened, about 2 to 3 minutes. 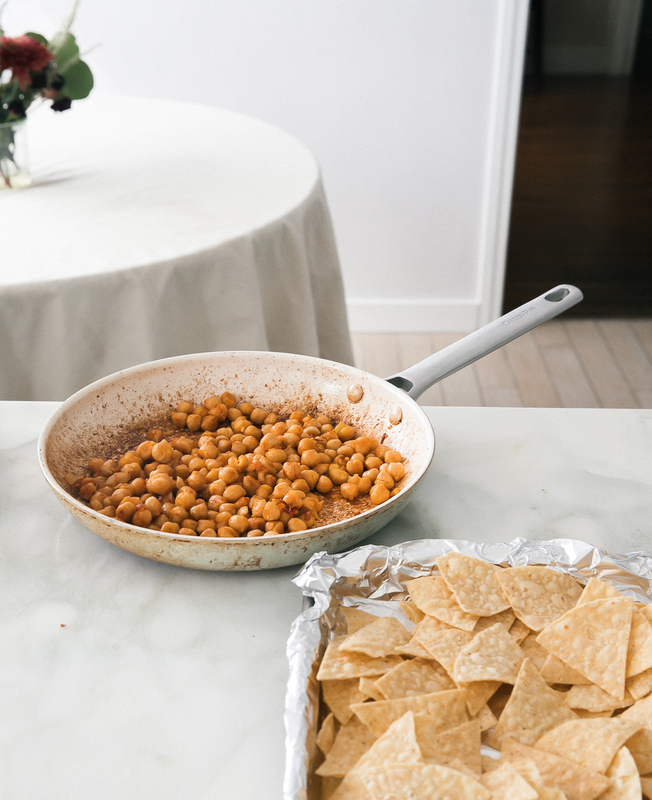 Pour in the chickpeas and season with the spices and a few pinches of salt. Add more olive oil if needed, I added a tablespoon more. Cook until softened, about 5 minutes, stirring regularly. 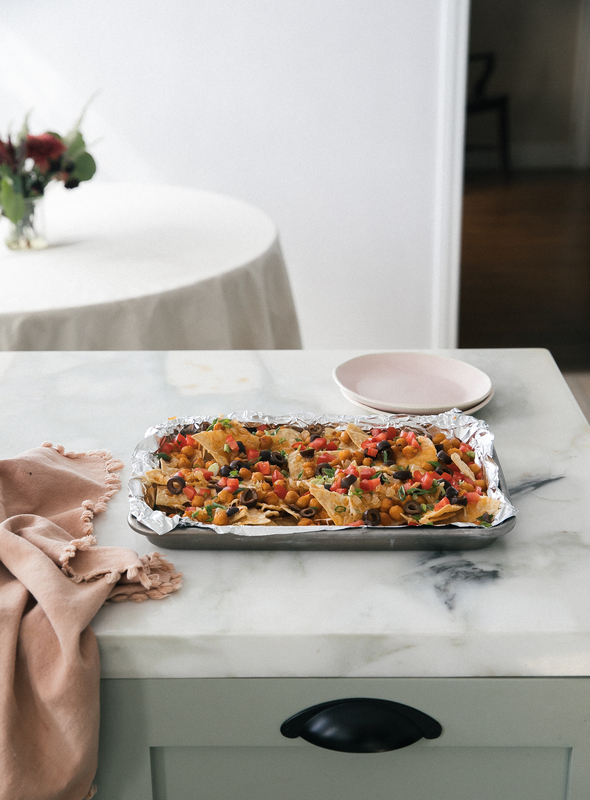 Preheat oven to 200 degrees F. On a foil-lined baking sheet, add one even layer of chips. Add half of the chickpeas and half of the cheese. Top with another layer of chips and again top it with the rest of the chickpeas and cheese. Transfer to the oven to bake for 5-7 minutes, or until the cheese is evenly melted. 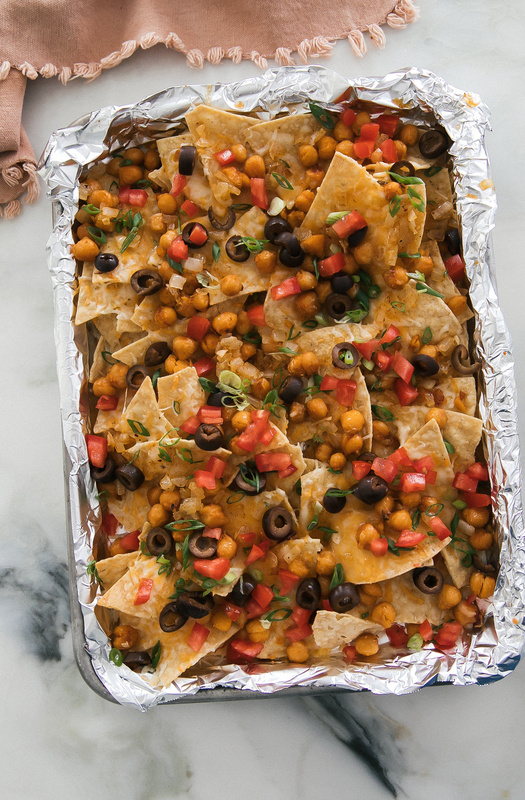 Sprinkle the nachos with minced tomato, black olives, minced cilantro and green onion.